Difficulties in the proceedings did not, however, end. To the contrary, the first prosecution witness raised eyebrows and paved the way for what was to become the singlemost controversial issue in the trial to date: the pretrial conduct of 'intermediaries', non-ICC employees who interviewed potential witnesses in the field on behalf of the Prosecutor. The first witness testified that his initial statement was untrue and that he had been trained what to say by one of the prosecution intermediaries. This testimony later was recanted. But as summarised in the Decision on Intermediaries (Trial Chamber I, 15 May 2010), several later witnesses provided similar accounts of promises in exchange for giving fabricated accounts of having served as child soldiers. In that decision, the Chamber ordered the disclosure of further details on some intermediaries who were already known to the Prosecutor. Crucially, the disclosure of one intermediary, P-143, was ordered, pending protective measures. The P-143 disclosure order-- and the issues it raises in the context of the "abuse of process" doctrine that has emerged out of the jurisprudence of the ad hoc international criminal tribunals -- is the crux of this post. involved a clear imputation against the judges. The Chamber further held that the interviewee had “seriously intruded” on the role of the Chamber, in a way that prejudged the outcomes of the abuse of process issue and the trial itself. The Press Interview decision is significant in that it points to the emerging pattern of frustration over the conduct of the prosecution. An apex was reached on 8 July, when Trial Chamber I granted another stay of proceedings on account of the Prosecutor's failure to comply with the Decision on Intermediaries. declines to be 'checked' by the Chamber. Whether the Prosecutor’s delay in following orders stands as an abuse of process in and of itself is debatable. A stay of proceedings stemming from an abuse generally only stems from the most exceptional of circumstances, and specifically for prosecutorial misconduct, when a court is convinced that a suitable caution could not cure the prejudice. It is notable that the current stay arose not from an abuse of process motion from the defence, but from the Chamber itself, as a Decision on the Prosecution's Urgent Request for Variation of the Time-Limit to Disclose the Identity of Intermediary 143 or Alternatively to Stay Proceedings Pending Further Consultations with the VWU. Despite the stay, the accused remains in custody. At July's end, citing a risk that the defendant might flee, the ICC Appeals Chamber suspended an order to release Lubanga that Trial Chamber I had issued mid-month. Meanwhile, developments in Lubanga are beginning to affect another case arising out of the ICC's Situation in Democratic Republic of the Congo. In the background to the drama of the Lubanga stay, defendants in Prosecutor v. Germain Katanga and Mathieu Ngudjolo Chui have continued to express their discontent, asserting that they are affected by the same issue of intermediaries. 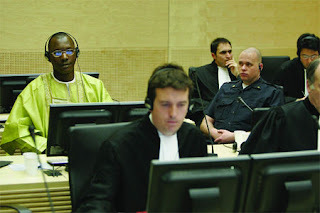 Accordingly Trial Chamber II, in its mid-July Ordonnance urgente relative à la mise en oeuvre de mesures de protection, ordered that the Victims and Witnesses Unit provide a report on the safety situation of intermediary P-143, the central figure in the Lubanga stay. It may be presumed that the Unit's confidential report will reiterate its assertion in Lubanga that the limited disclosure, as ordered, would not place P-143 under threat. If so, stays of proceedings -- as well as consideration of prosecutorial misconduct -- may be forthcoming in the cases against Katanga (near left) and Ngudjolo (far left). Whether the most recent finding of Trial Chamber I with respect to abuse of process in Lubanga will be upheld on appeal remains to be seen. In 2008, the Chamber lifted its stay of proceedings at the point that the conditions of abuse no longer existed, due to the Prosecutor's assurances that he would disclose the material he had previously failed to reveal. Regarding the present situation, if the Prosecutor offered finally to release the identity of P-143 and promised to comply unhesitatingly with all orders of the Chamber, the stay could very well be lifted, and the trial would proceed. ► If yes, whether the Prosecutor knew or should have known about this. If both points are answered in the affirmative, and another stay is therefore granted, it is difficult to imagine how the abuse of process could be remedied. The prosecution's case is closed, and all of its witnesses have been heard. The result in such a scenario could very well be “third time lucky” -- permanent release for Lubanga.